The pre-Raphaelite stained glass windows in the church were designed mainly by Edward Burne-Jones with contributions from Ford Madox Brown and William Morris and constitute one of the best collections of stained glass from the William Morris Company in the North of England. Click on any of the photographs below to see a larger version. The east window is unique in that while all the designs in the stained glass had been used in other churches, it is the only window in which they are combined. It has three lights with three roundels above, all designed by Edward Burne-Jones. To see more detailed pictures of the east window click here. The window on the north side of the chancel shows St. Mark and St. Matthew by Edward Burne-Jones and Ford Madox Brown respectively. 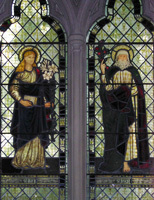 The window on the south side has St. Luke and St. John by William Morris and Ford Madox Brown. The background details in these windows are muted - most stained glass windows have landscapes of buildings in the background. The result of this relative simplicity is that the figures are thrown into greater prominence dominating the picture. The window in the south aisle dedicated to the friendship of John and Emily Miller and Eustace and Mary Smith shows St. Mary and St. Joseph by Burne-Jones and William Morris respectively. Many of the windows in this church were designed by Edward Burne-Jones but the one of Boaz and Ruth was by William Morris and was produced by the William Morris Company. It was dedicated to Edward Knollys and is situated in the North Aisle.